Trevor and Tennille on the Colorado Trail. Tennille is Trevor’s first guide dog. They met in 2012 at Guide Dogs for the Blind and graduated together. Trevor trained Tennille to be his backcountry partner, and Tennille was the first guide dog in history to learn this highly specialized work. 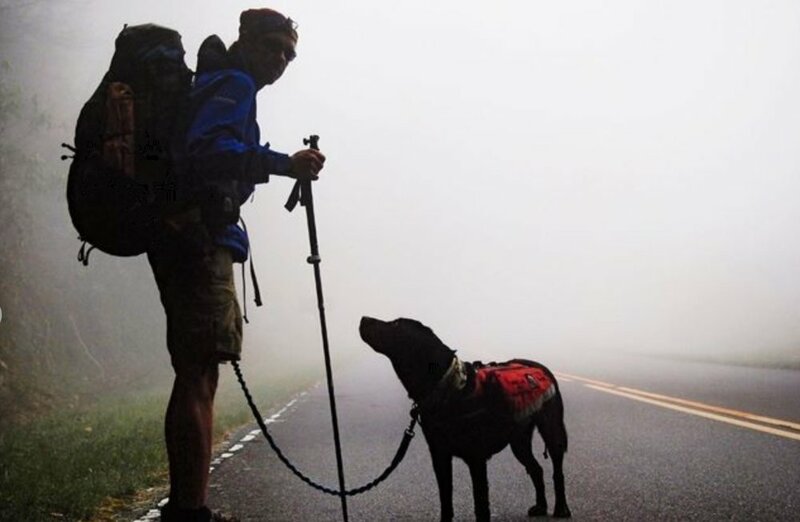 For nearly seven years, the pair travelled the country, thru-hiking the United States’ most demanding long-distance trails. In November 2018, Tennille retired. Today, she mentors Trevor’s new guide dog and enjoys exploring the woods near their home. Tennille on the Long Trail. Tennille has hiked more than 10,000 miles with Trevor. Some of her more notable thru-hike completions are The Mountains to Sea Trail, The Long Trail, The Tahoe Rim Trail, The Colorado Trail, The Ozark Highland Trail, The Smokey Mountain Range, The Shenandoah Mountain Range, Grayson Highlands, and Desolation Wilderness. Tennille has summited five 14,000-foot mountains, including Mount Elbert, the tallest mountain in Colorado. Tennille’s story has inspired many. She is an ambassador and sponsored athlete for multiple outdoor brands. She was featured on The Secret Life of Dogs television series and Service Tails, a book about service dogs. In retirement, she is enjoying shorter hikes, longer play time, and more naps by the fireplace in Trevor’s North Carolina home.